For some reason, I continually find myself drawn to point-and-click titles, even though they usually disappoint me in some way. Either the puzzles are so nonsensical that progression is a real battle, or the story is weak. Kelvin and the Infamous Machine possesses neither of these flaws; it’s a charming game that I wish had lasted a lot longer. Dr. Edwin Lupin should’ve made headlines when he built a fully functional time machine, but because his invention resembled a shower, the scientific community scoffed at him, considering the announcement so much of a joke that they wouldn’t test the machine out. In retaliation, Lupin jumped backwards in time to visit some of the world’s greatest minds and either take credit for their accomplishments or prevent them from happening at all. Now it’s up to Kelvin, one of Lupin’s research assistants, to set things right. As it turns out, inspiring Beethoven to write music again isn’t as simple as singing to him. You accompany Kelvin in tracking down Ludwig van Beethoven, Sir Isaac Newton, and Leonardo da Vinci, discovering how Lupin affected their timelines, and putting them back on their legendary paths. Will you be able to distract Newton from his Larry Plotter fanfiction, and will da Vinci still be able to produce a masterpiece when the wrong woman shows up for the sitting? These and several other zany situations show that Kelvin and the Infamous Machine isn’t short on personality. Its sense of humor is clear, from the silly characters and conversations to the numerous puzzles you solve on your way to inspiring genius. The story doesn’t stray into stuffy historical fiction territory, and it offers just enough sci-fi without getting bogged down. In spite of time travel being done so many times before, it feels original. Unlike its namesake, the Larry Plotter series has over fifty titles. He’ll be reading for quite a while. As I mentioned earlier, the puzzles won’t trip you up so much that you want to quit trying. They do present a challenge, and the difficulty increases as the chapters go on, but once you put the pieces together, everything makes sense. None of the steps you take toward the solution seem like they’re out of left field. Often I would go to bed, musing about what the incense or wooden hand from a statue could possibly be used for, only to wake up the next morning with the answers lining up in my head. The same cannot be said for many of the point-and-clicks I’ve encountered. 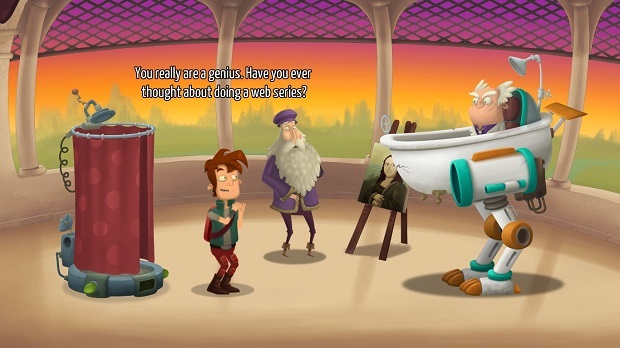 To go along with its colorful story, Kelvin and the Infamous Machine has a playful and cartoony art style. It’s clean and polished, yet still distinctive. The hover text lets you know what you can and can’t interact with, sometimes in humorous ways. Facial expressions, mannerisms, and dialogue are all full of detail, even for side characters that have no bearing on the story. It’s obvious that a lot of time and attention went into creating this game. Little things like this had me chuckling the whole time I played. On top of all this, there’s excellent voice acting. Most of the time this isn’t something I bring up in my reviews, because much of it is only average and not worth mentioning. In Kelvin and the Infamous Machine, the voice acting is absolutely impeccable. It serves to further flesh out the characters, and it rarely falls flat or feels inappropriate for the situation. I love the voice actors for Kelvin and his fellow research assistant, Lise, especially in highlighting how different their personalities are – Lise as a no-nonsense scientific expert, and Kelvin as a sarcastic extrovert with subtle smarts and a penchant for goofiness. When I try to dig down and find nitpicks for this game, I have a hard time coming up with much of anything. They’re all small things, like pathing being imperfect or the voice acting for a couple of the characters not being as strong, but such complaints are easy to overlook. Unlike other indie titles that start out in Early Access and later receive a proper launch, there are no bugs or fatal flaws to dissuade you from playing. When all else fails, get into a squint-off with the guard. It might work. I guess the only thing that truly disappointed me is that Kelvin and the Infamous Machine is such a quick adventure. I would’ve liked even one or two more chapters. There are plenty of historical figures to choose from, and I’m sure the team would’ve handled them just as brilliantly. While the game clocks in at about 3-4 hours, you may end up wanting to play it over to snag more of the achievements and listen to the quips. I know I’ll probably pick it up again soon. Kelvin and the Infamous Machine is a fresh take on time travel, with a diverse cast of characters thrust into hilarious scenarios. The puzzles aren’t so difficult that they’re maddening, but just enough to feel rewarding when it all clicks into place. You’ll be laughing out loud or scratching your head, but you won’t ever be bored.